1960 Plymouth Wagon Photo Picture Classic Cars for sale & Classifieds - Buy Sell Classic Car & Classic Truck Classifieds. 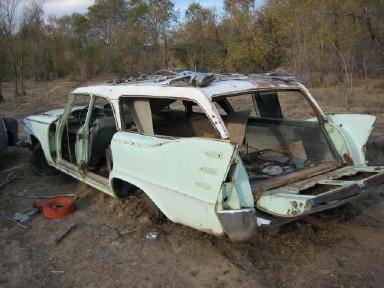 Another picture from "Ken" of this 1960 Plymouth "Suburban" Station Wagon. One of these beasts just a few miles from me. This is in much better shape. Depending on the model- does it have the 'squared off' steering wheel? Almost bought one of these out of West Virginia, be one long haul to get it back home to Albera, Canada though. More info on this site! what a cool hot rod this would make, especially with the ugly front end these have. nice one fingal....I agree with you and with doors this car is no doubt well worth restoring...great find! I BOUGHT THIS WAGON BACK IN NOVEMBER 2007 FOR $350 (WENATCHEE, WA). THE DOORS ARE ACTUALLY ALL THERE. THIS PIC DOESN'T DO IT JUSTICE!